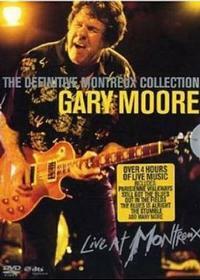 Gary Moore has brought his brand of rocking blues to the Montreux Jazz Festival a number of times. This killer set documents those appearances. It is a companion to the 5 CD set that was released last year. I reviewed that audio set already (including track by track) so, in terms of the musical performances I’ll direct you there because this is the same set – just delivered here with video. The performances are blistering and the sound and video quality are definitely worthy of this music. You really can’t go wrong with this set. In addition to all of the concerts being presented on the two DVD’s provided, we are given an audio CD. I guess you could look at that piece as a “best of” from the five disc version. If you’ve already gotten the CD set, I’d say you really should have this, too. Even if you haven’t bought either yet, I think I’d recommend having both. You can listen to the CD’s in the car and check out the DVD’s at home. That’s versatility in format. Moore provides the rocking blues to make it all worthwhile. This review is available in book format (hardcover and paperback) in Music Street Journal: 2010 Volume 2 at lulu.com/strangesound.